community support programme that raises essential funds for schools, charities and environmental organisations. Africa. You can make a difference to a worthy cause without costing you a cent! Carnegie House Montessori is a registered beneficiary of the My School programme. The success of the programme depends on the number of times you swipe your card! 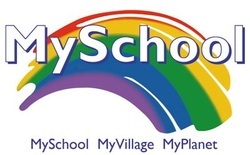 Supporters can use their cards at a range of national, regional and local retail partners on the MySchool MyVillage MyPlanet system. Some of the national partners include Woolworths, Engen QuickShops, Waltons, SupaQuick, kalahari.com, Jack’s Paint, Toys R Us, Reggie’s, Altech Netstar, Club Travel, MySchool Travel, Toner Town and many more. It is so convenient using one card at many different stores. There are over 11 national partners and over 2000 partner stores where you can use your card across the country. Woolworths (which includes 10% or more off on over 200 items in their stores and other tiered benefits). How to become a supporter - get a card now and support Carnegie House Montessori! In order to become a supporter, you need to be registered with the MySchool MyVillage MyPlanet and select Carnegie House Montessori as your beneficiary. You can register by completing the online application form, or get a card at your local Woolworths store.